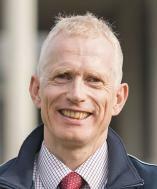 Biography: Dr. Hayo Reinders (www.innovationinteaching.org) is Professor of Education at Unitec in New Zealand and TESOL Professor/Director of the doctoral programme at Anaheim University in the USA. He is the founder of the Global Institute for Teacher Leadership (www.teacherleadership.ac). Hayo has published in the areas of autonomy, technology, teacher education, and out-of-class learning. He edits a book series for Palgrave Macmillan and is editor of the journal Innovation in Language Learning and Teaching. Abstract: It	is	estimated	that	by	2020	there	will	be	over	50	billion	connected	devices. This	will	go	beyond	cellphones	and	computers,	to	include	objects	such	as	cars,	household	appliances,	and	– as the	technology	improves	– clothes,	utensils	and	all	manner	of	everyday	items. The	possible	uses	of	these	devices	and	the	enormous	amount	of	data	they	will	generate,	are	as	of	yet	unclear. In	this presentation	I	will	show	their	possible	impact	on	the	field	of	education	and	in	particular	I	will	consider	how	we	can	make	connections	between	the features	of	such	new	technologies, and	their pedagogical	affordances,	or	potential	benefits for	learning	and	teaching. In	this	talk	I	will	therefore	describe	the	Internet	of	Things	from	a	pedagogical	point	of	view,	give	some	examples	of	emerging implementations	and	research,	and	propose	three	areas	of	potential	impact	on	education,	clustered	around affordances	relating	to	mobility,	augmentation	and	ubiquity. I	will	conclude	by	identifying possible	benefits	and	drawbacks	for	education	professionals and	show	how	the process	of	identifying	affordances	of	technological	developments	is a	prerequisite	for successful	design,	development and	engineering	innovation. Abstract: This presentation will consider ways in which ideas from game theory and game design can be applied in education to improve students' motivation and engagement. These ideas will be illustrated with examples from the presenter’s own experience creating activities and courses for language learning. Of central importance in these learning materials is making the goals of the course, and the steps to achieve those goals, clear to the students. To this end, the presenter has made use of the Moodle Learning Management System (LMS) to create blended learning environments that support students of varying ability and aptitude and encourage active learning through collaborative work in pairs and groups. The result is a “flipped classroom” in which students prepare outside class for performances and assignments done in the classroom. Responses from student surveys show that students have found these courses useful and enjoyable. The Moodle-supported courses employ various tools and techniques. Some of the technologies, such as conditional activities and digital badges, are available in standard Moodle, while others, such as the Scoreboard block and extended Reading activity, have been developed by the presenter and can be added to a Moodle site as 3rd-party plugins. Biography: Ana Cristina García-Luna Romero investigates the production and perception of the public space and housing from an interdisciplinary approach to establish environmental criteria in the design and construction of the city. Professor at the University of Monterrey in the Department of Architecture where she has also been in the Chair of the Department of Interior Design. She has lived, studied and worked in the United States, Brazil, Germany, Spain, Belgium, Guatemala, Costa Rica, Ecuador and Mexico. Because of her interest among the field of realization of forms and space, aesthetics and product engineering, has postgraduate studies related to construction management as well as in architecture and sustainability. Currently she is working on her doctoral thesis. In her professional career has over ten years of practice where she has worked either with national and international architects and designers. Cristy combines her interest in architecture, design and urban sociology with her passion for travel around the world by offering consulting and training in different countries. Abstract: Cities are our future. Ninety percent of the world's population growth is expected to take place in cities. Not only are cities becoming bigger, they are also becoming more complex and changing even more rapidly. The concept of sustainable cities is a function of the human dimension or scale of cities. The paradigm is based on understanding that first is the life of the people who inhabit the cities, then the space they occupy and, finally, the buildings and its current technology. From this inclusive approach planning should always start from the people. It is essential to understand that what is required, today, are more human and inclusive cities that offer public spaces that facilitate and guarantee the fulfillment of the rights and freedoms of all people. In Latin America, 80% of citizens live in cities, so we must think about how to humanize the scale of the city. We are investigating how new models for urban architecture can be more responsive to the unique needs and values ​​of individuals through the application of disentangled systems and smart customization. We are developing technology to understand and respond to human activity, environmental conditions, and market dynamics. We are interested in finding optimal combinations of automated systems, just-in-time information for personal control, and interfaces to persuade people to adopt sustainable behaviors. A double reflection on the dimension of humanized cities comes in thinking: what makes a city smart? Biography: Kenichi Namai earned a Ph.D. from the Department of Linguistics at Georgetown University. His specialties are linguistics and English language education. He has been teaching at Waseda University since 1997. He has held visiting professorships at Indiana University-Purdue University Indianapolis (2006), the National University of Singapore (2017), and the National University of Malaysia (2017-2018). Since 2003, he has given lectures on Japanese culture to a variety of international guests at the Japan International Cooperation Center and the Japan International Cooperation Agency. He is also the leading author of the Discovery English Communication and New Discovery English Communication series (Kairyudo), which are senior high school textbooks officially certified by the Ministry of Education, Culture, Sports, Science and Technology. Abstract: The Japanese have been known for their poor English for decades, despite all the efforts by the Japanese Ministry of Education, Culture, Sports, Science and Technology (MEXT), which has long been trying to solve this problem by frequently revising schoolteaching guidelines –– all in vain. According to the latest guidelines, English is going to be added to the elementary school curriculum for third-graders in 2020. At the same time, instruction using ICT in schools will be officially permitted by the MEXT. Some teachers have already experimented with ICT in their teaching and have reported good results. However, these still remain largely anecdotal, with so many others pointing to the impracticality of ICT-based instruction. With a severe shortage of qualified teachers to begin with, the current situation surrounding English education in Japan thus seems chaotic at best. Against this background, this presentation suggests a possible solution from the way baseball has been taught in Japanese high schools. It will introduce the way practice is conducted by successful teams, which have been producing quite a few professional players. In fact, some players become so good that they even get recruited by the Major Leagues in the United States. There is so much to learn from Japanese baseball in improving English education, and it will all be explained in the presentation. Additionally, an alternative solution, which may be called the "Singaporean Way," will also be entertained. Biography: Prof. K. Naruse is currently a full professor at the University of Aizu. Some of his major research revolves around information system for multiple heterogeneous robots, autonomy, and tele-operation in the physinfo real world, smart house, office, building, disaster respond robots and agricultural robots; theory of robot action intelligence: representation, learning, and sharing. He received his Ph. D (Engineering) from Graduate school of Hokkaido University, Japan and worked as post-doctoral research associate at New Jersey Institute of Technology, U.S.A., and held faculty position in Hokkaido University. Abstract: We often think as a robot is a mechanical and electrical machine, however, it is a computational node as well. Even in a tele-operated robot system, we should design software components for each of robots, networks and computer deployment, interface design, and databases. If it is an autonomous one, it involves machine learning and artificial intelligence. Therefore, software development is so important in robot development. At the same time, we need new type of robot engineers who understand all mechanical, electrical, and informational engineering. We have not had an education program for the above engineers, therefore we have been developing it. We call the new one as dualware engineers, who can develop both hardware of mechanical and electrical parts and software of information system. In this talk, I will present the project of the robot information system in the university of Aizu and education program of the dualware engineers. Biography: Nobuo Funabiki received the B.S. and Ph.D. degrees in mathematical engineering and information physics from the University of Tokyo, Japan, in 1984 and 1993, respectively. He received the M.S. degree in electrical engineering from Case Western Reserve University, USA, in 1991. From 1984 to 1994, he was with the System Engineering Division, Sumitomo Metal Industries, Ltd., Japan. In 1994, he joined the Department of Information and Computer Sciences at Osaka University, Japan, as an assistant professor, and became an associate professor in 1995. He stayed at University of California, Santa Barbara, in 2000-2001, as a visiting researcher. In 2001, he moved to the Department of Communication Network Engineering (currently, Electrical and Communication Engineering) at Okayama University as a professor. He was the chairman at IEEE Hiroshima Section in 2015 and 2016. His research interests include computer networks, optimization algorithms, educational technology, and Web technology. Abstract: To enhance Java programming educations, we have developed a Java Programming Learning Assistant System (JPLAS). In JPLAS, the code writing problem asks a student to implement a source code that passes the given test code on JUnit, where the details of the implementation are described in the test code. Previously, we confirmed the effectiveness of this informative test code approach in studying three object-oriented programming concepts for Java. In this paper, we present its application to studying Java Collections Framework (JCF). JCF enables us to handle a group of objects by offering appropriate libraries, which is expected to be mastered by the students. For evaluations, we generated five informative test codes for JCF, and asked 19 students from Japan, Myanmar, China, and Indonesia to implement the source codes. Then, all of them completed the source codes passing the test codes, while certain students did not use the expected JCF library functions. Biography: Hiroyuki Chishiro received his B.S., M.S., and Ph.D. degrees from Keio University in 2008, 2010, and 2012, respectively. He became a research fellow of the Japan Society for the Promotion of Science (PD) in 2012, a research associate at Keio University in 2014, and an assistant professor at Advanced Institute of Industrial Technology in 2016. He is presently a project lecturer at The University of Tokyo in 2017. His research interests are real-time systems, operating systems, middleware, and trading systems. Abstract: This speech presents OS Buffet, which applies active learning for education of Operating Systems (OSes). In my previous work, I performed enPiT, which is an education project with Project Based Learning (PBL) by Ministry of Education, Culture, Sports, Science, and Technology in the Japanese Government, and the faculty development camp for PBL. I learned some knowledge about active learning by PBL. My research interest is OS but OS community is not so large compared to education one. In order to promote OS community, I have applied active learning for education of OS. I introduce the overview of OS Buffet and give some feedback from participating students in The University of Tokyo, Japan.